Our final month of school at ICS was filled with learning, fun, and sharing our gifts with others. We also continued with activities and projects that we started earlier in the year. Our Grade Four garden was an incredible success and will continue to be looked after by the families of the Grade Four class over the summer. 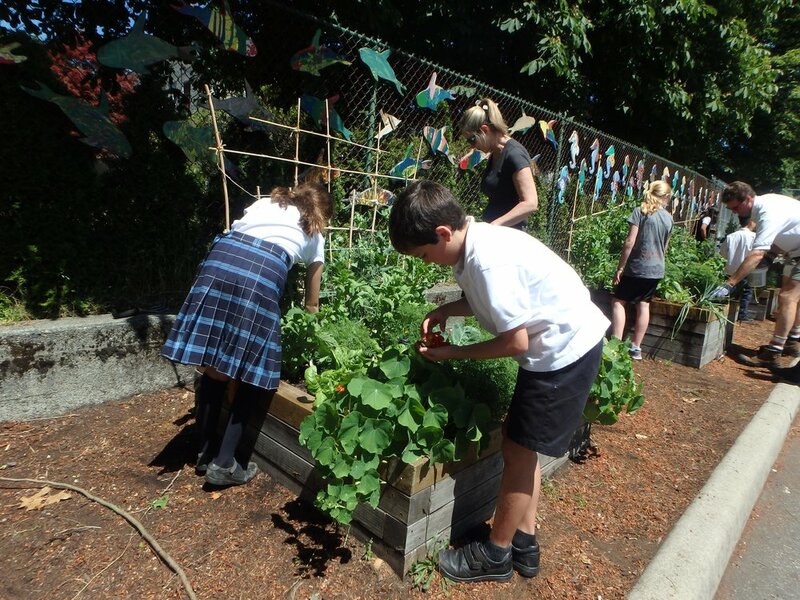 What bounty we have to share – our garden is a true metaphor for our school community. Read on to discover more about the final days of the 2014-15 school year. Our Math Club, which met every Wednesday at lunch time and was led by Dr. Van Raamsdonk, had its final meeting and the students received certificates from the Caribou Math Competition in which they competed regularly. The Caribou Math Competition is a world wide online contest that is organized by Brock University. There are six contests throughout the school year and in between the contests, the members of the Math club spent their time working cooperatively to solve creative math problems – these sessions were boisterous and full of laughter and competition. If you love Math, this was the place to be on Wednesdays at 12:15. The final days in Grade Five were spent learning, learning, learning. The students worked together to design and assemble structures using tinker toys and other creative building materials. They also put together a truly informative and unique history fair, focusing specifically on Chinese immigration in Canada. Parents, students, and teachers alike learned a great deal when touring the displays. The final days of school were not all work, as can be seen below in the photos of the Grade Seven field trip to Jericho Beach. Sports Day, held at Memorial Park on Friday, June 19th was a huge success. The Grade Six and Seven students composed cheers and taught them to the members of each of their teams, which was no easy feat! Over the final weeks of school each class collected a box of unused school supplies to be donated to the Salvation Army back to school charitable program which helps supply elementary school children in need with new school supplies. The drive was organized by one of our parents who also made the delivery of the items to the Salvation Army. Thank you to those who donated goods. We wish you all a safe and joy filled summer!